Want to cook up BBQ so tasty your guests beg for seconds and talk about it for weeks? Now you can learn to make everything you grill or barbecue 100% more flavorful almost overnight, getting the perfect results you could only dream of before... while grilling steak after steak, and rib after rib, exactly how you want it, as consistent as clockwork... and, if you're like most barbecuers, turning heads at your very next BBQ! "Last week Lisa asked me if I could give her a grilling lesson. First I taught her the basics about preparing our grill for use. Next I taught her how to make some delicious Barbecue Pork Ribs. She did all the preparations, along with my guidance, beginning with a simple rub recipe and a barbecue sauce I got from Randy Pryor's "Barbecue Secrets Revealed!" The end result was an A+ for Lisa. The ribs were tender and juicy with a little heat and great flavor. Chef Jay, Author of "Grillin' With Heat"
"I can't tell you how many times I've recommended Barbecue Secrets Revealed! to my friends! The very first time I tried one of your recipes, my friends were momentarily speechless - until they begged me for my "BBQ secret." Now, I'm the queen of "Q" in my neighborhood! Thank you, Randy"
In order to avoid total disaster, do you know the 3 most important questions you must ask yourself before you begin any Barbecue? Get Randy's "Top 7 Amazing Barbecue Tips" delivered to your inbox - FREE! These killer tips will give you a sampling of what's in store for you in "Barbecue Secrets Revealed!" (Don't worry, I hate spam as much as you do. 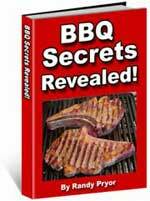 Inside "Barbecue Secrets Revealed!" you'll discover all types of exciting tips. From how to make the ultimate rubs and sauces... to what supplies you'll need. From how to barbecue baby back ribs that taste even better than the ones served in famous restaurants... to how to tell when your grill is at the perfect temperature for the meat you're preparing! "Everything you wanted to know about Bar-B-Q but didn't know where to ask." My friend Randy Pryor has knocked the ball outa the park with "Barbecue Secrets Revealed!". This has got to be the best read about "how to" do anything with BBQ, sauces, rubs, grills, you name it. Over 100 recipes for rubs, 58 marinade recipes, 23 hard to find BBQ sauce recipes. Easily worth 3 times the asking price!" "Barbecue Secrets Revealed! is like the bible of BBQ. The recipes of rubs and marinades are worth the price of the book. (Try the Holland Marinade, it's my family's favorite!)" ...I just wanted to let you know... the eBook I got from you on Barbecuing: excellent, excellent, excellent! There were things in there I had no idea about. ...By the way, I really want to thank you for your quick response to my several emails, I really appreciate it. Anyway, thanks again, and keep up the good work!" So, how much better would you feel knowing all this information, and more? Wouldn't you have a much better chance for successful barbecues? To have someone do all this research for you would typically cost around $1,000. Particularly laser-guided accurate information like this - SPECIFICALLY for Barbecuers. This isn't some cookie-cutter collection of answers. Which is why "Barbecue Secrets Revealed!" is such a bargain at $37.77. That's right, only a fraction of what it's really worth and what it cost me to research. Heck, that's less than you'd spend for one good BBQ meal! Why would I make it so affordable? Simply because my costs to deliver it to you are so low. This is an electronic book (ebook) that can be downloaded to your computer in a flash. Which means you can be reading it and discovering all these simplifying, money-saving, and time-saving tips in as little as 5 minutes from now. So, I figure I'll be able to offer this fantastic resource of information (which if you follow the tips contained in its pages could help you get to barbecue victory in no time) to more people. And make my investment back over time. No matter what, it's a bargain for you. And yes, I plan on raising the price from $37.77 to $47.77 very soon. Once I get a few more testimonials from satisfied customers, the price will increase. So you'll want to be quick if you want to save some bucks. $37.77 is a drop in the ocean compared to the awesome fun you'll have using these tips and all the money you'll save by not "ruining" any more meals! Remember, you're discovering the closely guarded secrets of competition-level barbecue! I have to hand it to you; this is about the most thorough, and user friendly book I've read of its kind. So far, I've used 4 of your recipes (2 rubs, and 2 sauces) all 4 were excellent! I'm anxious to show off to my friends! So thank you. Your work is obvious, and much appreciated." ...I just wanted to call and say Thank You for such a terrific Barbecue book. You know, the very first recipe I tried was a huge hit! My family and friends loved it, and you made me look really, really good! I'm looking forward to using more of your killer recipes and taking all the credit for myself! Anyway, thanks again for a great book!" You did a great job on this book. It gives you more than enough information to either get you started into the world of BBQ'n, if you're a novice, and it can even teach an old hand a thing or two. It's great! Thanks again." "I've been grilling for years but my results were not consistent. Now, after reading BBQ Secrets Revealed!, I've finally learned the right way to get perfect BBQ every time! If I had this book years ago; I would have saved a ton of money on meat. Thanks, Randy!" "As a new griller, I've been searching for a "how to" book that starts from the very beginning. The instructions in Barbecue Secrets Revealed! are clear and easy to follow. The tips and advice are just what I needed to get cooking. All barbecuers should have this book." Remember the promise I made to my grandfather-in-law? I promised that I will not sell these recipes and information to just anyone. There is ONE very serious condition that you must agree to in order to purchase the e-book. You must agree to NOT DISCLOSE the information you will learn from reading my book. By agreeing to this, you are agreeing to not publish my secret recipes, tips, tricks, and/or techniques in any product of any kind. This means you CAN NOT publish my recipes or techniques in any book, manual, video, audio recording, article, CD-ROM, Web Site, or anything else. You can't publish my information, but you can certainly share this information personally with your family and friends. I don't mind that at all. And, by the way, don't worry, if for any reason you're not happy with the book, you have a complete guarantee to protect your investment. Hey, you're my customer. And if you're not happy, it's bad for both of us. So if you're dissatisfied in any way with what you discover from "Barbecue Secrets Revealed!," I don't expect ... or want ... to keep your money. Just simply click off an email to me and I'll happily refund your money in full (in fact, I'd be embarrassed to keep it). OK? So you really can't lose! The book's yours no matter what. But I tell you what I'll also do to make this the best investment you ever make. I'm going to throw in some free bonuses which could literally turn you into a Grill Master in a matter of days. See, learning barbecue basics is one thing. But knowing how to continue to grow is another. It's probably safe to say, that even the most knowledgeable Barbecuers in the world would quickly fall behind the times if they didn't know how and where to find more information, on a continuing basis, true? LIMITED TIME - FREE BONUS EBOOKS AND REPORTS VALUED AT $69.80! Discover everything from the most popular Barbecue websites to the best buys on the internet. Learn precisely where to find: BBQ Pits, BBQ Units, Supplies & Equipment, BBQ Utensils, Charcoal Grills, Gas Grills, Sauces, Spices & Seasonings, Smokers, Specialty Meat and Steaks, Specialty Woods, Plank and Charcoal, Tons of Free Recipes, and other Books on Barbecuing and Grilling. You'll learn 164 simple, real-life definitions of the terms, expressions, and "slang" you absolutely need to know. You'll understand the difference between a rub, a mop, a brine and a sauce. You'll know Short Ribs from Pork Ribs and Baby Back Ribs. The definitive collection of recipes for the chicken wing lover. Filled with easy, addictive recipes that run from classic to exotic, you will discover some of the BEST chicken wing recipes in the world! Surprise your family and friends with just some of these must-be-tasted-to-be-believed chicken wing recipes and they won't touch fast food again! Beaujolais-Glazed Wings Hot 'n' Sassy Buffalo "Wings"
Betty White's Wings Pacifica Hot 'n' Spicy Wings W/B. C.
Buffalo Wings w/Blue Cheese 2 James' World's Hottest Wings! Now, I've gotta tell you, the reports alone contain some of the industry's top "insider" information. Together you've got a total of 186 BONUS resources, 101 incredible chicken wing recipes, 55 killer copycat recipes, and 164 easy-to-understand specific Barbecue terms that you can use to fire up your dream BBQ's into mouth-watering reality! Isn't that great? And I'm not charging you a cent for them! They're each worth far more than their combined $69.80 value. But hey, if you order right now, they're yours FREE. Congratulations! I just started BBQ'ing last year and have been trying to find a specific part - a pipe burner - for my grill. While I was surfing the net, I found your e-book on Barbecuing. Don't get me wrong, your book is terrific (and I love the recipes and advice), but, I bought it because of the BONUS reports. And I'm glad I did. Now that I've found the part, I'm a grillin' monster again. Thank you!" But, to be honest, I don't know how long I'll keep these bonuses available. They're part of a marketing test I'm doing and at any time I could take them down forever. So if you want 'em, get in quick. P.S. Remember, you're getting everything you need to prepare unbelievable barbecue meals (and save hundreds of dollars in potentially wasted food costs) and $69.80 worth of bonuses FREE. So, if that's what you'd like to do, this is the opportunity you've been waiting for. NOTE: We use ClickBank to process all orders. ClickBank utilizes the strongest security and anti-fraud features available on the Internet and never stores your financial data on their system. Your credit card data is passed directly to the bank and no one but the bank has access to your information. They're also approved by the Better Business Bureau.